Airpower R2 - SOS Safety International Inc. Many people ask, how does the Airpower R2 differ from the Airpower R1? They look like the same shoes! Essentially they are the same boot, with a few small differences. The Airpower R2 offers a smooth leather polishable toe since some departments make that a requirement in their station boots. 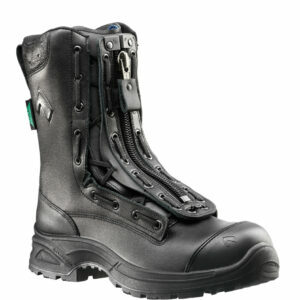 When a polishable toe is needed, HAIX® Airpower R2 is just the boot for you. We also added a few areas of reflective material on the back heel and along the zipper, for better visibility while on emergency calls at night. Because an extra roomy steel toe is built into the HAIX® Airpower R2, your toes gets plenty of room to move around while still being protected from impact blows and compression. All without pinching or cramping your foot. The built in arch support helps you maintain comfort throughout the day even after you’ve been standing for long periods of time. The right support not only prevents foot pain but also potential foot problems in the future. And with the laced in zipper system, you can achieve a more personal fit by adjusting the lacing how you like but still take it off quickly and easily after a long hard day. 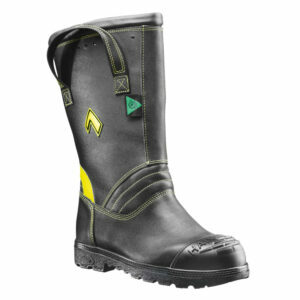 European leather craftsmanship is evident in these EMS boots which ensures longer lasting durability. 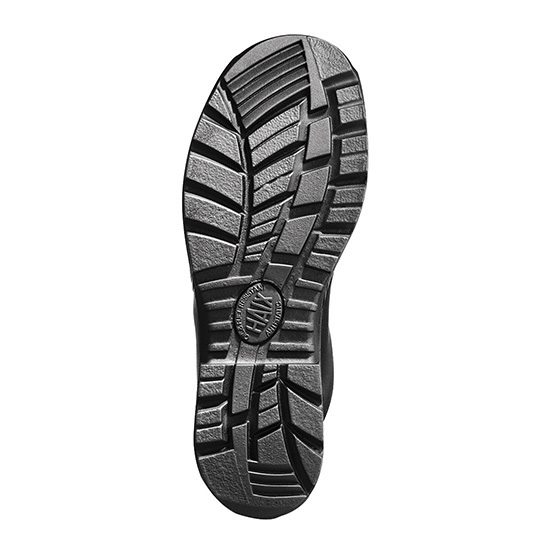 The specially developed rubber sole with its slip resistant, heat resistant, oil and fuel resistant and antistatic features ensures that you are able to move freely on the job without any worries. Since HAIX® soles are also non-marking, you leave no hard to remove scuff marks on your clean floors. With a steel puncture plate embedded into the shoe, you get the best puncture resistance there is. The even better part? You won’t even know that it’s there. The HAIX® Airpower R2 is waterproof and breathable and has added protection against chemicals and bloodborne pathogens with its CROSSTECH® inner liner. And because it works together with the HAIX® Climate System, your feet are guaranteed to stay comfortable and dry no matter what temperature is. 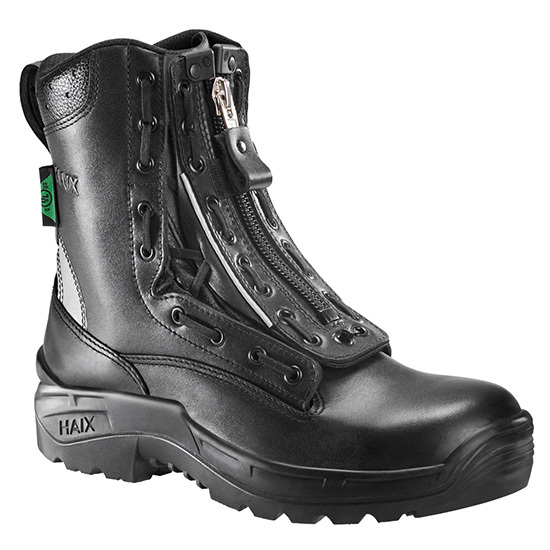 The HAIX® climate system allows the air in your boots to circulate, since the movement of your feet when walking, literally pumps warm and moist air out of the inside of your shoes. It’s an amazing feature that protects you from the little nuisances that keep you from performing your job. The HAIX® Secura Liner® feature guarantees that your inner liner will never pull out or wrinkle up over time. There is nothing worse than walking around all day feeling an uncomfortable ridge where the liner has bunched up. HAIX® Sun Reflect leather also makes sure that your feet are kept cooler even when under direct sunlight. The patented lacing system of the HAIX® lets you adjust the tightness of your boot depending on what is comfortable for you and it won’t loosen after only a few minutes of pressure. 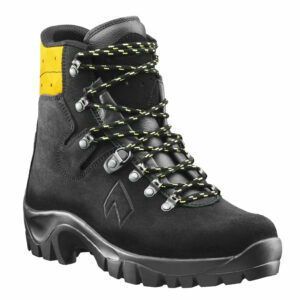 This ensures that you never have to worry about retying your boot while in the middle of saving lives on the job. At the end of the day, you can easily take off the boot in a few seconds through the front zipper and pull tab. Because after a long and hard day at work, the last thing you’ll want to deal with are shoe laces. The HAIX Airpower R2 is also NFPA certified for EMS which means it was specially designed to withstand and protect you from what you may encounter during emergency medical situations.